My setup for the population density map of New Zealand made it easy to create new choropleth maps with New Zealand census data. This blog post explains how you can use Leaflet to switch between multiple interactive layers created with TileMill. 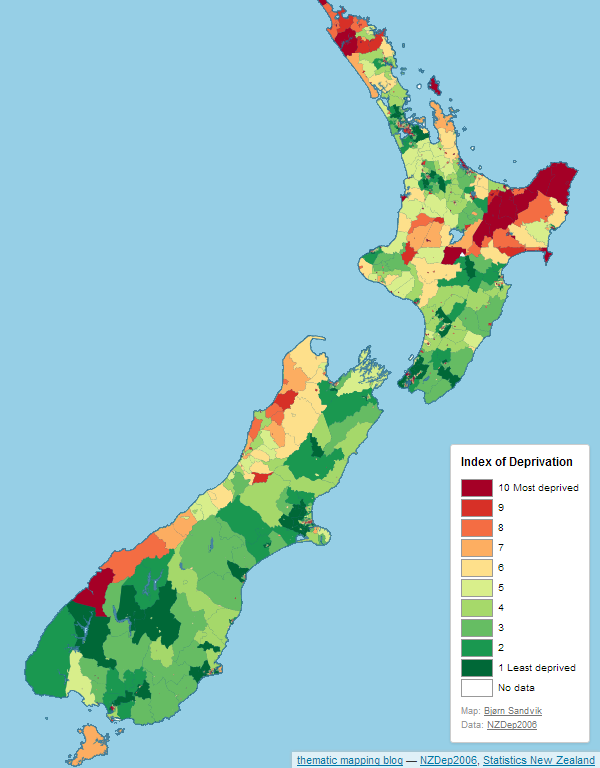 I wanted to create a map of the social geography of New Zealand, using the Index of Deprivation from the Department of Public Health, University of Otago. I downloaded a Excel sheet containing data for the 2006 census area units, which I also used for my population density map. I simply added the data to the same SQLite database, and created the map using the same techniques described in two previous blog posts (1, 2). The Index of Deprivation is constructed from nine Census 2006 variables, and provides a summary deprivation score from 1 to 10. A score of 1 is allocated to the least deprived 10 percent of areas, and 10 is allocated to the most deprived 10 percent of areas. You'll find more information about the index in the Atlas of Socioeconomic Deprivation in New Zealand. Include a wax property when you create a tile layer, containing a TileJSON object or an URL to a TileJSON file. This is very cool stuff. I am struggling to get the functionality to work. Would you mind sharing the .html and script.js that you used to integrate Wax and Leaflet for this cool web map. Thanks! Thanks a lot for explaining lots of stuff about using MapBox (TileMill) tricks and techniques. I am quite new in both mapping and web-designing, despite leaned quite good staff by reading your blogs and repeating myself. I am greatly thankful to you for that. I would be quite thankful for that. I wish you the very best in doing what you love, and helping others. Bakyt: Please try MapBox support. I've been looking at your post and find your implementation very interesting. Am trying to replicate the functionality using offline tiles generated using tilemill. The json files produced by tilemill however are surrounded by a function 'grid();' helnce are throwing an error "grid is not defined"